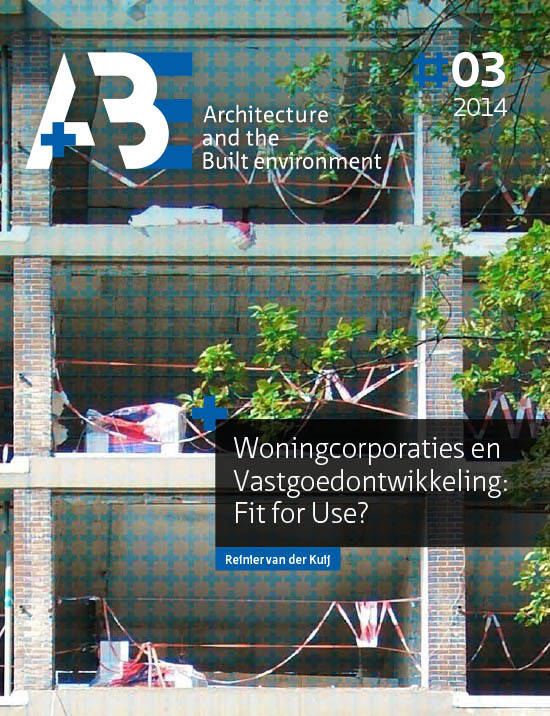 No 3 (2014): Woningcorporaties en Vastgoedontwikkeling: Fit for Use? This summary highlights the findings of the PhD-thesis ‘Woningcorporaties en Vastgoedontwikkeling: Fit for Use’ (‘Housing associations and Real Estate Development: Fit for Use?’). A large part of the thesis contains a description of the complex organization of real estate development by housing associations. This summary contains the background, most important findings and answers on the main research questions. Even though housing associations have been developing real estate for many years, it is still unclear which organizational setup is successful. We hardly know what is exactly needed to organize the activity of real estate development successfully within an organization which is focusing on different activities at the same time. We do not know what exactly causes so many questions and debate on real estate development by housing associations. 1 What is real estate development? 2 How is real estate development organized within housing associations and which problems are experienced by housing associations organizing real estate development? 3 Which troubles 33 can be seen in the division of responsibilities between employees from housing associations involved in the process of real estate development? This research can be defined as both an explorative research and a research by design. A survey has been conducted in 2009 of 56 housing associations, over thirty interviews are held throughout the research and three explorative case studies have been executed. This empirical exploration has unraveled the tangle of problems as De Leeuw (2003) defines in perception problems, goal-setting problems and actual problems. Further research has been focused on the found actual problems in the division of responsibilities. A method of analysis is specifically designed to be able to give a structured overview on this division. This normative diagnostic model has been used and tested in three case studies with housing associations, selected by variation in size of the organization and organizational structure. Research question 1: What is real estate development? Literature describes real estate development from two different angles: real estate development as part of the business discipline of real estate management and real estate development from the perspective of the real estate life cycle. The two angles combined describe the complete activity of real estate development, as shown in figure 44. The first phase of the real estate life cycle corresponds with the formulated demand for transition of the existing stock in the business discipline on the level between portfolio- and asset management, resulting in the initiative of a plan. The demand, objectives and conditions are defined as well as the first rough idea of the project. The next phase is the development of this first idea to a realized project, the design and the construction phase. Throughout this phase, which is conducted by the developer, tuning has to be done (partly depending on the amount of freedom given by the framework of the project and organizational agreement which is made) with the future owner and user of the real estate. The next phase, the exploitation phase, starts with the delivery to the party responsible for future exploitation of the project. The definition of real estate development within this research is, by the combination of the tow different angles, the process from the initiative of (re)developing real estate by an organization with a demand for transition of their real estate stock till the acceptance and transfer to the user of the realized real estate by an exploiting company. Research question 2) How is real estate development organized within housing associations and which problems are experienced by housing associations organizing real estate development? A clear and univocal answer cannot be given on how housing associations organize real estate development. A few distinctive elements, however, can be identified and described: • Housing associations cannot univocally be identified with a specific characterization of their position as developer of real estate. However, most housing associations recognize the movement made until 2009 from a exploiting real estate owner developing dwellings to a both social and commercial project- and area developer. Since 2009 housing associations have been refocussing on being a (social) developer of living areas and dwellings. The position of real estate development within the organization structure varies strongly, but relates to the size of the organization. If the size of the organization increases, the position of real estate development within the organizational structure is more independent. The independent development organizations, however, are regrouping within the organizational structure of housing associations since 2009. In the area of project-control nearly all housing associations admit that they had to learn how to act as a developer. Housing associations are still evolving and professionalizing on this subject, in different ways and speeds, and are mainly concentrating on defining a solid framework of demands for developing, improving their real estate development process and developing steering instruments for project-control. Project-control is experienced as a big concern by most housing associations. Respondents from housing associations say they experience a lot of problems during the execution of the process of real estate development, especially in the initiative and definition phase of a project. Details of these problems will be discussed under research question three. An entrepreneurial culture, needed for real estate development according to most respondents, is missing at housing associations even though ambition torealize numerous projects is high. In addition, employees of housing associations experience different cultures within the housing association itself. This strongly occurs between real estate related departments and departments focusing on services and between employees with a more commercial and with a more societal background. The diversity and correlation between experienced problems in the organization of real estate development is complex and plural. The problems occur within different elements of the organization at the same time, with hardly any possibility to distinct the impact of a separate problem. All respondents, however, state that the organization of real estate development by housing associations can be improved. The goal-setting problems respondents indicate can, from a research point of view, be related to the problems in defining and executing the (real estate) strategy of the housing association. This corresponds to the findings of Nieboer (2009) and Dankert (2011). The perception problems relate to an expected possibility of always being able to improve an organization, independently from a specific topic. These problems are logical in a sector which context has been highly dynamic in recent years. The experienced actual problems are mainly related to the way employees and departments interact, their division of responsibilities, within the organization and during the process of real estate development. A systematic overview of these problems is not yet available and further research will focus on this division of responsibilities. Research question 3) Which troubles can be seen in the division of responsibilities between employees from housing associations involved in the process of real estate development? Investor: defining the exploitation program and the demand for transition with linking objectives and conditions. Developer: organizing the real estate development process from the moment the demand is formulated till delivery. Manager: managing the exploitation process. Decision maker: considering the different interests of the organization. Operator: allocating the resources of the organization. The method of analyses is applied in case studies on three housing associations, HW Wonen, Woonstad Rotterdam and SWZ. The first steps of the real estate development process contain a relatively large amount of troubles. This is reflected by organizational troubles in missing objectives and a missing framework for real estate development. Experienced troubles are relatively less on these subjects in the first steps of the development process, but they occur nevertheless when the conditions for realizing the real estate development ambition has to be concretized. Troubles with the role of the Investor occur by the missing objectives and conditions for development. The role of the Investor is largely missing in the first phase of the development process. The role of the Decision maker is troubled with a discussion on commissioning and by lack of or diffusive decision making itself. Formally this seems to be well organized, but nevertheless troubles are experienced. This is specifically mentioned at the moment where different interest of the organization come together, for example at the determination of the Program of Demands. In further steps of the development process troubles, organizational troubles as well as experienced troubles, are less univocal. All organization experience troubles between the roles of the Developer and the Manager and between the Developer and the Operator, but these troubles differ from one organization to another and can therefore not be generalised. The results of the case studies are used to reflect on the problems which were found in the general explorative study. A big part of the troubles can be related to problems found in the different elements of the organization. Troubles with the role of the Investor and in the first steps of the process can be strongly related to the problems found with the diffusive and non-univocal defining of a vision and strategy for real estate development. The identified problems in project-control are, as far as problems in the process concerns, logically overlapping. However, no specific relation has been undoubtedly found between a specific way of organizing and troubles which were found. The formal structure and way of working differs (strongly) in these three organizations. One slight relation can be found: where the organizational structure is formed following the company division structure seems to experience less troubles in the process than organizations with a traditional structure. Each structure, however, has his own (dis)advantages and is influenced by specific other elements of the organization. More research has to be done to find these relations, in which elements such as project-organizations and involved parties outside the organization have to be taken into account. Troubles in the division of responsibilities do not relate to all problems found in the empirical exploration. Problems with competencies of employees or with the organizational culture can be seen separately from the troubles in the division of responsibilities. Respondents from the researched housing associations are unanimously positive about the content of the method of analysis. It helps them to understand and structure (part of) the problems which they experience during the development process. The results of applying the method invites them to discuss and reflect possible solutions to improve the process of real estate development. The results itself are not surprising, but the structured way of analyzing helps them to see the context and relation of the different troubles together. The unraveling of the different roles (Investor, Developer, Manager, Decision maker and Operator) combined with the insight in division of responsibilities adds to finding a solution for the troubles they encounter in their organization. This research aimed to describe the activity of real estate development by housing associations and aids to find solutions to problems housing associations encounter in the organization of real estate development. An immediate solution cannot be found through the complexity and diversity of the problems and troubles this research has exposed. A direction for the solutions has been found as some of the troubles can be categorized. Further research on the subject of real estate development by housing associations can and should be continued in this direction. The market conditions on the real estate market and the institutional context of housing associations have changed dramatically during the unfolding of this research. This has intensified the debate on the position and organization of housing associations as societal entrepreneurs. Different directions are proposed, for example the ‘driekamergedachte’ by Conijn (2013), the subdividing of the housing association in a societal investment-company and a market driven real estate company by Vlak (2011), thoughts on a director-organization by Dreimüller et al (2013) or even scenarios in which housing associations cease to exist (Idenburg 2013). Other thoughts are heading towards new cooperation models between housing associations, market parties and tenants or house-owners themselves. Independently from these futures developments, the activities in real estate development housing associations are undertaking now have to be conducted in the future as well. The organizational context might change, the activity still has to be done. This emphasizes the importance of thinking from the perspective of the identified roles and functions in real estate development. Future research and development is therefore recommended to take the findings on the division of responsibilities in the process of real estate development into account. Some suggestions can be made for each role. The importance of the Investor will increase. To fulfill long-term objectives in cooperation with other organizations, with limited own means or in new organizational models, insight in the (im)possibilities of the existing real estate stock is essential. This requires strengthening of the Investor-role, by research or by experience in practice. The position of the Developer is insecure within the current organizational set-up of housing associations. It is not unlikely the Developer will be organized completely besides the current organization, while the housing association focusses on his (social) investment obligations. The interaction between Investor and associated Developer will need to be developed further to eliminate the current troubles. Another option is a different set-up on the investment or institutional side of the organization: real estate development will be simplified to project- of building management in order to realize projects within tight boundaries set by the ‘new institution’. The Manager faces a same dilemma, but the direction is more clear: the Manager will be confronted with increased pressure on the (financial) result of the exploitation. The Operator will need to adapt to different organizational models and arrange to optimize the use of available means. The role of the Decision-maker might shift outside the organization, for example in a corporate of cooperative board with other stakeholders. This increases the need to make decisions on subject matter instead of hierarchical decision making. Another three directions of further research are recommended, based on the findings in this research. One direction could be based on measuring and calculating the efficiency and effectiveness of different ways of organizing the activity real estate development. In addition to ongoing research on supply chain management (for example the ‘Ketenmonitor’ by CPI which is already aiming to measure the correlation between organizational approaches and results of projects), research can be extended to measuring actual costs of all efforts made by organizations or experiment with different models of cooperation, following the thoughts on the division of responsibilities as shown in this research. The second direction is to extend this research to related organizational elements such as culture, competences of employees of leadership in real estate development. Third direction is to extend the analysis of the division of responsibilities to other parties involved in the process. The troubles in the division of responsibilities as shown in this research reveal the gaps and inconsistencies in the process of real estate development by housing associations. It is logical to assume that this diffuse division of responsibilities is causing a difficult insight in the actual process and critical decision making for the supervisory board or external commissioners. Insights from this research might not explain why excesses and incidents over the past few years have happened in the housing sector. But the lack of clarity in who is responsible for what certainly adds to the difficulty to maintain a clear and realistic view on the process of real estate development. The results of this research show that the process of real estate development by housing associations is vulnerable to (un)intentional misacting by individuals. This opens up possibilities for people to, even without speaking of questionable handling, let projects end up in a situation which is beyond control or repair. Are housing associations ‘fit for use’ to conduct the activity of real estate development? Housing associations have evolved ever since the balancing and grossing act of 1995, but this research shows that multiple and complex problems and troubles still exist in the organization of housing associations. The balance between different parts of the organization is still not found. The needed roles for successful real estate development are not clear enough to perform a flawless process of real estate development. In different stages of the development process troubles occur, which leads employees involved to state that the efficiency, the effectiveness and the quality of the real estate developed is suffering from it. The insights given by the analysis with the method used in this research are seen as a helpful step towards improvement of the organization of real estate development by housing associations. Housing associations are not ‘fit for use’ at this moment, but are able to take the next stept to get ‘fit for use’.